A world first sensory experience will be officially opened at The Great War Exhibition this evening and to the public on Saturday April 14. Set at Quinn’s Post, a tenuously held frontline position on the Gallipoli Peninsula, visitors will enter another world of the grit and hardship experienced by New Zealand soldiers during this ill-fated campaign. Private William Anderson, of the Otago Infantry Battalion. Created by Sir Peter Jackson, The Quinn’s Post Trench Experience combines his world acclaimed storytelling artistry with a personal passion for First World War military history and stories of the experiences of New Zealand soldiers. 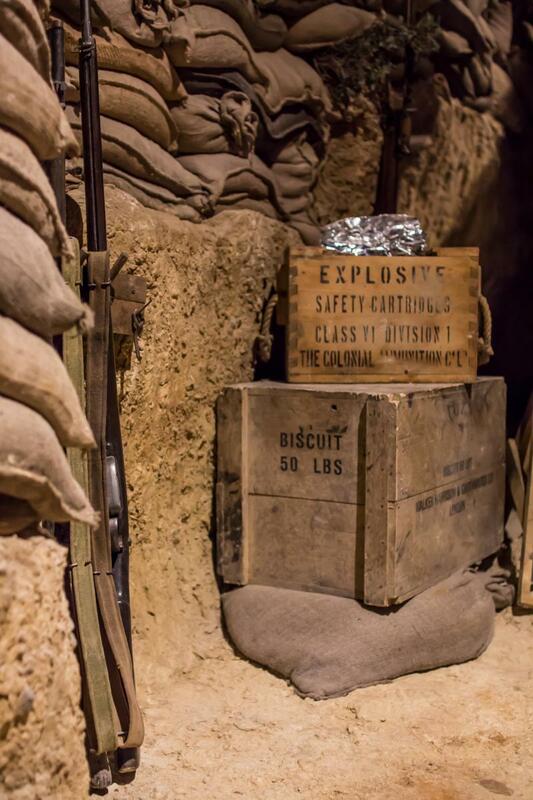 Explosives and biscuits in the Trench Experience is courtesy of The Great War Exhibition. With the help of cutting edge technology, visitors will be guided through Quinn’s Post by the ghosts of New Zealand soldiers. Guests will experience the sights, sounds and even smells of Gallipoli 1915. There is nothing else like this in the world. This addition to The Great War Exhibition provides visitors the opportunity to experience the bleak and dangerous conditions New Zealand soldiers endured during the Gallipoli campaign. “We hope visitors find the experience both exciting and insightful. It is truly immersive and will, we believe, bring people as close as you can get to experiencing the conditions faced by our Anzac troops”, says Clare Olssen, Executive Producer at Wingnut Films. 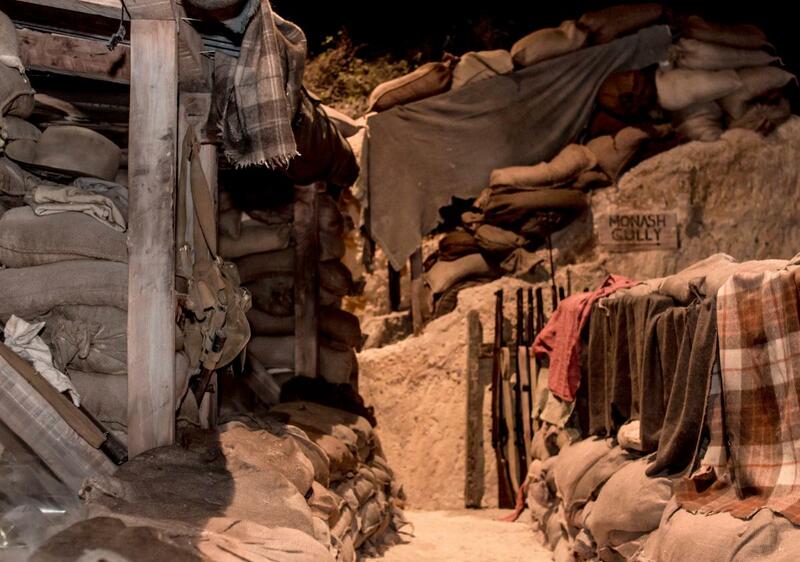 View of the Trench Experience is courtesy of The Great War Exhibition. Great care has been taken to ensure that the terraces, tunnels and trenches accurately reflect those of Quinn’s Post as it was in 1915. In places, the Turkish trenches were only a few metres away from the ANZACs – within bomb throwing distance. Soldiers on both sides expected to be wounded or killed at any moment. “The intent of The Great War Exhibition has always been for visitors to gain increased understanding and awareness of New Zealand’s military history, and the impact of the First World War upon our society” said General Manager, Dave Clearwater. The technology behind the Trench Experience is both elaborate and extensive. An old Victorian theatrical trick called ‘Pepper’s Ghosts’ and new sophisticated technology work together in this faithful replication of the trenches, dugouts and tunnels to populate the environment with living, working, talking, ghost soldiers. Over 350 intricately timed DMX lighting, audio and video circuits are controlled over a dedicated network. “The show controller is much like that used in a theme park” says Technical Director, Ian Bidgood. More than 50 speakers and 38 amplifiers installed throughout the experience ensure visitors feel totally immersed in the atmosphere. “It is always fun working on a Peter project. He has an idea and challenges us to make it work. If it was not for these technical challenges our job would not be so enjoyable” says Director of Sound Engineering, John Neill. It is believed that with Sir Peter Jackson’s direct input into all aspects of this world first experience, domestic and international tourists will add this to their ‘must do list’. This is the latest addition to the ground-breaking Great War Exhibition which opened in Wellington on April 2015. The Exhibition, created by Sir Peter Jackson and supported by ANZ, commemorates the role played by New Zealand in the First World War, and has received international acclaim since opening. It is the highest rating 5 star attraction on TripAdvisor in Wellington. The Great War Exhibition, is located in the Dominion Museum building, and forms an integral part of Pukeahu National War Memorial Park. The Exhibition is open daily between 9am – 6pm. Admission fees apply.